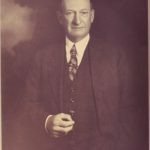 The Cleveland Metroparks will be celebrating its 100-year anniversary this weekend, so we thought it appropriate to share the history of one of the parks driving forces — William Stinchcomb. Kerruish brought an infectious spirit and a strong social conscience to the campus. Although American-born, he took great pride in his heritage and taught his language teachers how to speak Gaelic. He also became deeply involved in the abolitionist movement and convinced his fellow students to invite Frederick Douglass to deliver a commencement address in 1854, a choice that stirred up considerable controversy. Kerruish then finished up his education at Yale — once again teaching the Gaelic language to his instructors — and returned to Cleveland to practice law. 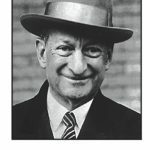 He became the head of one of the city’s best law firms and continued to practice law until his death at age ninety-six. He also found time to marry Margaret Quayle, an emigrant from the Isle of Man, and raise a large family. Their daughter Miriam was born in Cleveland on November 7, 1870, and shared her father’s probing intellect and social conscience. After receiving a bachelor’s of arts degree from Smith College in 1892, Miriam enrolled at Wooster Medical College and graduated in 1895. She became the first female doctor ever to practice at Cleveland City Hospital, where she specialized in obstetrics and pediatrics. Dr. Kerruish soon became convinced that poverty was responsible for the illnesses of many of the children she was treating. She emerged as a champion of child welfare, organizing the Women’s Protective Association of Cleveland and serving on the board of trustees of the Woman’s Hospital, the Maternity Hospital Council and many other noble causes. She also became active in the woman’s suffrage movement, starting the Cuyahoga County Woman’s Suffrage Party and spearheading its activities. In the midst of all these endeavors, she also found time to give birth to and raise four children — three boys and a girl. Their clinic at Euclid Avenue and East 93rd Street opened its doors in 1921 and three years later a 184-bed hospital began to admit patients. At the 1921 opening, Crile articulated the vision of the founders. One of the pinnacles was ongoing education that was not departmentalized as in a university but in which doctors communicated new findings tow one another through a schedule of daily conferences and lectures. This dialogue, Crile explained, was “not only our duty to the patient of today, but no less out duty to the patient of tomorrow.” Just as important was the commitment to ensuring that, “the patient with no means and the patient with moderate means may have at a cost he can afford as complete an investigation as the patient with ample means.” (Clough, 39-41) It is easy to see why the setting was a perfect fit for Miriam Stage and she became one of the leaders of the Clinic’s Women’s Hospital. Billy Stage never remarried. While he was still in mourning, the stock market crash brought an end to the Van Sweringens’ empire. He retired in 1939 and passed away on May 17, 1946, at the Cleveland Clinic where his wife had practiced and met her untimely death. His death occurred on the seventeenth anniversary of his wife’s funeral. CLEVELAND, Ohio – Poison gas, machine guns, flame-throwers and rapid-firing artillery were among the new battlefield horrors of World War I, capable of killing and maiming hundreds of thousands of soldiers in a single battle. Transporting and treating the flood of survivors from this carnage was a nightmare for medical personnel, most of whom who had never handled the type or number of these wounds before. Cleveland provided a modest but important contribution to confronting this challenge in the form of Dr. George Crile and the Lakeside Unit. Crile, who would later co-found the Cleveland Clinic, was a surgeon at Lakeside Hospital (now University Hospitals) with a keen sense of scientific curiosity and the ability to tackle medical mysteries. The Lakeside Unit was formed when Myron Herrick, a Clevelander and ambassador to France when World War I broke out, asked Crile to organize a surgical team to come to France to study medical conditions. A team of volunteer surgeons and nurses was recruited from Lakeside Hospital and spent three months in Paris in 1915, treating more than 1,200 war-wounded patients. Crile, who served in the U.S. Army Medical Corps during the Spanish-American War, anticipated that America might be drawn into World War I, and devised a plan for mobilization of civilian hospitals for overseas military service. “His theory was that a unit of medical men should be a group that has worked with each other in the civilian world so that they are a package, a unit that can be picked up in the U.S. and moved overseas . . . hit the ground running and not have any training to worry about once they get there,” said Jennifer Nieves, registrar/archivist at the Dittrick Medical History Center at Case Western Reserve University. 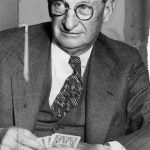 Crile worked with American Red Cross officials on a plan creating 25 units at hospitals across the country that would be able to respond and serve overseas under Army supervision if the U.S. went to war. Nieves, a contributor to the new book “Glimpsing Modernity — Military Medicine in World War I,” said Crile also prompted a review and upgrade of U.S. Army medical equipment. Less than a month after America declared war on Germany in April of 2017, the Lakeside Unit — including 27 medical officers, 64 nurses, and 155 enlisted men — was headed back to France. The unit was designated as Base Hospital No. 4 and took over a former British military hospital (No. 9) in Rouen. The unit would stay nearly two years, its ranks swelling to 42 physicians, 124 nurses and 356 Army enlisted men, treating more than 83,000 patients from both sides of the war in two hospitals. Nieves, curator of a Dittrick exhibit (running May through September) about the 1917 experience of the Lakeside Unit, said Crile was “the perfect person to go over there” with the Lakeside Unit. “He saw it as a living lab,” and an opportunity to further his research in how shock and traumatic injury affects the entire body, she added. Crile also brought along a few innovations that he helped develop. He was among the first to use blood transfusions on patients, and taught the French how to use nitrous oxide as an anesthetic that did not leave patients violently ill (like chloroform and ether) when they regained consciousness after surgery. Crile designed some of his own surgical clamps and forceps, and while overseas discovered that sea water could be used when saline was in short supply to stabilize patients. His surgical techniques . . . become critical in treating massive numbers of wounded. Even before the war, “what makes him so fascinating is because he is unconsciously anticipating a modern application of all his surgical techniques that will become critical in treating massive numbers of wounded, particularly wounds coming out of World War I that had never been seen before,” said James Banks, director of the Crile Archive Center for History Education. The center is a repository of materials about the famous Cleveland surgeon and World War I, located on the west campus of Cuyahoga Community College in Parma (formerly the site of an Army hospital named for Crile during World War II). 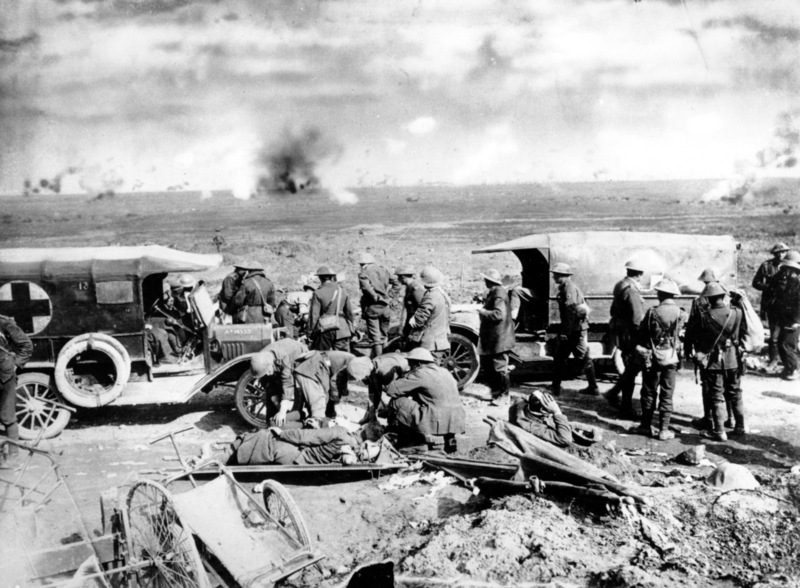 Banks said that in touring battlefront aid stations during the war, he was amazed at the number of soldiers who had died without a mark on them. Suspecting that the blast of exploding artillery shells might have been involved, Crile conducted experiments using stray animals. Part of Dr. George Crile’s work during World War I involved studying the concussive effect of artillery. (AP photo)”Sure enough, if they were in the direct line of a concussive blast, they were killed,” Banks said. Banks believes that Crile was in his natural element during the war. “It’s the excitement, it’s the fact that this is a whole laboratory of testing the human spirit, its physiological capabilities,” he said. In Crile’s study of how shock resulting from traumatic injury could cause death, he developed a rubber suit fitted to patients that could be constricted with a bicycle pump to prevent loss of blood pressure, according to Banks. “He was the first one to recognize the correlation between shock and the lowering of blood pressure,” Banks said. Crile recognized the importance of transporting wounded soldiers as quickly as possible to medical treatment to gain the upper hand against infection, a scourge of the front. “What he’s really talking about is the ‘golden hour’ (for treatment) now known in emergency medicine,” Banks said. But Crile and members of the Lakeside Unit weren’t immune to the psychological impact of war. Nurses were advised “not to become too attached to some of these young men because chances are they’re not going to survive,” Nieves said. Even Crile “did get emotional when he came back to Cleveland in 1915,” she added. “He did comment in his diary pretty much what you hear soldiers say today – You’re coming back to something to something that’s now foreign to you because you are not ducking and worrying about the next bomb exploding over your head. “He definitely did feel there was a huge difference between what he had experience and what he was coming home to,” she said. 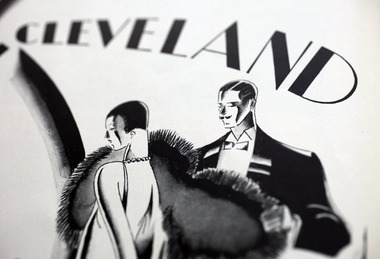 ELEGANT CLEVELAND / A look back at the finest elements of Cleveland’s stylish history, as shown by its people, architecture, fashion and other cultural touchstones. Go to tinyurl.com /elegantcleve to read other entries. In the early 20th century, magazines showed Americans who they were. Not just in words, but through new technology that allowed photographs to be crisply reproduced, far more so than newspaper printing allowed. Time magazine — which was headquartered and published in Cleveland from 1925 to 1927 — was one such periodical, and during that period acquired its iconic red border. Although Time’s stay in Cleveland was relatively short, the city had been a longtime center for printing, publishing and lithography. And while a number of national magazines were thriving in the 1920s, including such titles as Vanity Fair and Vogue, many Clevelanders could avail themselves of a close-up of this city’s own cafe society. Of the 80 Northeast Ohio publications in print in the first third of the 20th century, several were devoted purely to Cleveland’s bluebloods, their homes and travels, with photo features of them playing golf or polo at local country clubs or posing in an engagement or bridal portrait. Among the most successful of such magazines was Cleveland Town Topics, which had gotten its start in 1887 — the same decade in which Cleveland’s social register, the Blue Book, began to be published. Another was the Bystander, which had been named Town and Country Club News in a previous iteration. Eventually, the Blue Book’s publisher and arbiter of admission, Helen DeKay Townsend, became the society columnist for Town Topics. Cleveland Town Topics billed itself as “A Weekly Review of Society, Art, and Literature.” At its start, it was edited by a Vienna-born fellow named Felix Rosenberg, who once served in the Confederate army but eventually made his way north to Cleveland. The publication was first housed in The Arcade but moved later, as many other publications did, to the Caxton Building. The Caxton had specially built floors that were able to support the weight of printing presses. Charles S. Britton became its longest publisher — for 25 years — until it folded. 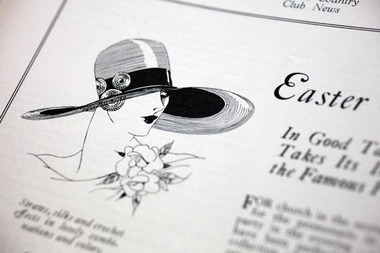 The Bystander began as the Town and Country Club News in January 1921. At first, as you might expect, it was very social in its themes and was run largely by a group of female volunteers, among them the eventual historian and author Grace Goulder-Izant. Many of these women were college-educated, often at one of the Seven Sisters colleges, and they undoubtedly welcomed the chance to use their intelligence in a magazine endeavor. No one is sure what happened to either Town Topics’ or the Bystander’s business records or subscription lists. 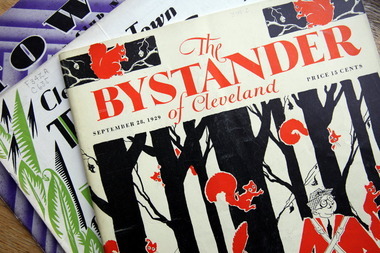 You could subscribe to the Bystander for about $3.50 a year or buy a copy at “better newsstands” or at the city’s “finer hotels,” according to information on its masthead — and it was even available at some hotels in New York that Clevelanders favored. In the city’s newspapers, too, drawings and sketches were giving way to photos, but it was on the coated semigloss paper of the magazines that photographs really popped. It all added up to popularity among those in the “right circles,” but no doubt also for those who aspired to such circles. After all, the 1920s were about nothing so much as reinvention. As Grabowski says, Town Topics and the Bystander may have been a version of People magazine for the Jazz Age. After all, if housewives in Iowa could read Lucius Beebe’s syndicated column out of New York about the doings at the Stork Club, why wouldn’t Cleveland housewives want to know about the doings at Shaker Heights’ country clubs? Today, those magazines — which at their peak were said to have had a combined subscription of 10,000 or so — offer a rich vein for historians. The Western Reserve Historical Society has a nearly complete collection of the periodicals, from the 1880s to the early 1930s, and they are relied on by people doing research on family members, interior design or fashions of the time. The dailies, for example, wouldn’t have had the space to report the minutiae of country club golf and tennis matches, played by men and women on separate occasions, or horseback riding, the hunts or yacht club races. Yet details like these enrich our knowledge of an era in a way that likely will never be replicated. Browsing through Town Topics and Bystander issues from the 1920s and early ’30s offers some snapshots — gleaned from stories, columns and advertisements — of life in a once-elegant Cleveland. We can see that some things are not as new as we think they are — getting a colonic is something the occasional Town Topics classified urged — though some options sound a little dangerous. For a time, the Allerton was trying to draw bachelor businessmen as long-term residents. An illustration of two men in bathrobes, standing in front of a bathroom sink, has one telling the other how a friend brags of living near “everything.” “He must live at The Allerton,” one of the men remarks. The Gardner Sanitarium — a photo shows a Victorian house, complete with turret — offered help for “invalids, mild mental, nervous and alcoholic patients” in private, homelike surroundings. The periodical continued its focus on a world where all was well, as may have been the case for many of its readers — for a while. Women got plenty of ink, whether for their social and sporting activities or professional work. Town Topics had stories and photos of female judges, such as Lillian Westropp and Mary Grossman, and of Linda Eastman, the nationally acclaimed director of the Cleveland Public Library. But far more space was devoted to social doings, with a paragraph noting, for example, that “Miss Martha Stecker left Thursday night for the East. She will attend the Yale-Princeton game today in New Haven.” Or an aside that “Mr. and Mrs. Clarence Osborne have closed their home in Chardon and are at 3222 East 140th Street for the winter.” Or again, a mention that a tea was held at the Hunt Club in honor of Miss Jean McMillan’s debut. Stories of society weddings, though, were an occasion for high specificity of detail. The wedding of Miss Elizabeth Chisholm to John Rust Chandler listed every type of floral arrangement and fabric featured, from the bride’s white satin gown to the blue hyacinth chiffon worn by the bride’s 14 attendants at the ceremony at Trinity Cathedral. Walter Halle, of department-store fame, was the groom’s best friend and best man. But amid the stories of parties and teas were sadder tales, many conveyed in obituaries or memorial notices. A memorial service was held for Myron T. Herrick, the U.S. ambassador to France, also at Trinity Cathedral, at which former Pennsylvania Sen. George Wharton Pepper spoke of Herrick’s valor in the days leading up to the Great War, in 1914 in Paris. Pepper also spoke of Herrick’s charitable work with French soldiers blinded in the war. Sadness seemed to pervade the pages as the 1930s wore on. Town Topics had combined with the Bystander in 1930 in a last-ditch effort to save itself and had begun using that name. By 1933, as the Depression worsened, its page count grew paltry. The single-copy price dropped from 15 cents to 10 cents, and it became a monthly instead of biweekly. Art Deco-style covers in vivid greens or fuchsias turned black-and-white. Covers began to feature unglamorous daily life — one cover photo was of a steel blast furnace; another was a grim black-and-white shot of pigeons and sparrows scratching for food on a snow-covered Public Square. Even the stories inside had changed. Now, there was a full-length feature on how the employment provided through the New Deal’s Civil Works Administration fed some 40,000 people in Cuyahoga County. An inside photo showed CWA workers clearing Doan Brook. Magazines that were 52 pages trickled down to 36. By April 1934, the Bystander printed what was to be its last issue. There were still dashes of style — an interior design feature showed the sleek Moderne aesthetic of the Pumphrey family’s apartment at Moreland Courts. But the cover of that issue gives it away, featuring a drawing by Salvatore Liscari that the magazine called “La Nymphia.” It’s a sketch of a sad little girl, looking down at the ground. It may not have been intentional, but the image conveyed a future with little hope for gladness. The slice of the world depicted with such joie de vivre in Town Topics and the Bystander for decades was gone, never to return to Cleveland in quite the same way again. Turning back through their pages, however, the ’20s continue to roar. News researcher Jo Ellen Corrigan contributed to this story. HUNTER, JANE EDNA (HARRIS) (13 Dec. 1882-17 Jan. 1971), prominent African American social worker, founded the PHILLIS WHEATLEY ASSOCIATION. The daughter of a sharecropper, she was born Jane Edna Harris at Woodburn Farm near Pendleton, SC. She acquired her last name by a brief marriage. Hunter graduated in 1905 as a trained nurse from Hampton Institute, VA, and came to Cleveland, serving in various nursing jobs. She attended Marshall Law School (later Cleveland Marshall Law School of CLEVELAND STATE UNIVERSITY) and passed the Ohio bar examination. Hunter organized the Working Girls Association in 1911 to provide safe living quarters for unmarried African American WOMEN and girls who needed a place of residence. Later that year, the name changed to the Phillis Wheatley Association. The association was modelled by 9 similar institutions throughout the United States. Hunter served as the association’s executive secretary until 1948. Following retirement, she founded the Phillis Wheatley Foundation, a scholarship fund for African American high school graduates. The foundation later established the Jane Edna Hunter Scholarship Fund in her honor. Hunter held honorary degrees from Fisk University, Allen University in Columbia, SC, and Central State University in Wilberforce, Ohio. She founded the Women’s Civic League of Cleveland (1943), belonged to the NATIONAL ASSOCIATION FOR THE ADVANCEMENT OF COLORED PEOPLE (NAACP), and served as vice-president and executive committee member of the National Association of Colored Women. Website and education tools for teaching the life of Jane Edna Hunter. From Clemson Univ.